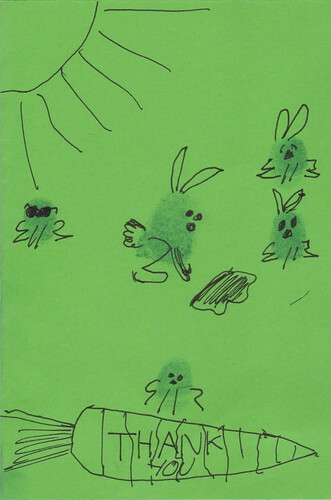 Fingerprint bunnies by Max Macauley, originally uploaded by theoclarke. This is the thank you card that I received from my young neighbour Max. Short observation: cute. Longer observation: a nice, spontaneous cartooning style. He could be a great cartoonist. I thought that this was good for anyone, not simply good for a 10-year-old. I particularly like the single bunny with shades. The idea of using fingerprints is good, too. They work well with the ink lines. It is good for any age. Better yet, he should be exploited by me!